Many people come to Spain hoping for a break—from workplace and cubicle monotony, from the demands of a high-powered job, from the stresses of everyday life. But Spain is not the only place to “get away from it all.” Indeed, Mario and I will be heading to Destination #2 (Romantic Getaway) in mid-November. He’s never seen Paris, while I have. I totally agree about London being a place to “see the sights.” Sometimes Spain’s monotony of cathedrals and castles gets old, and it’s fun to be in place with a ton to see! 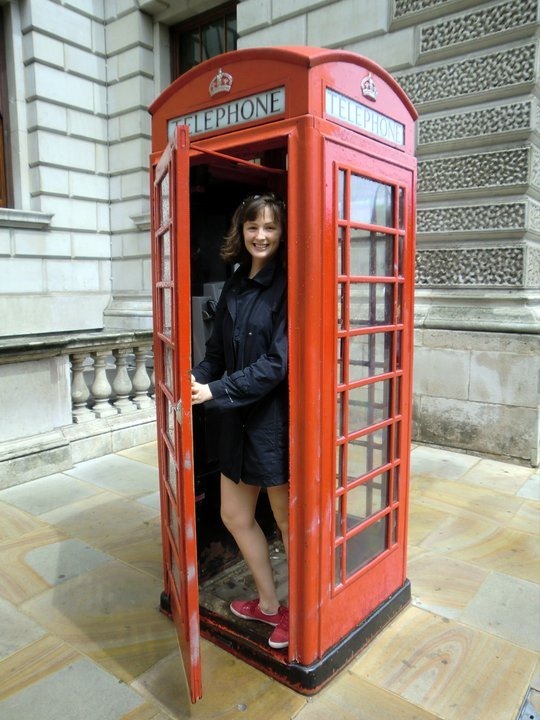 I loved the red telephone booths, of course, along with just about everything else! 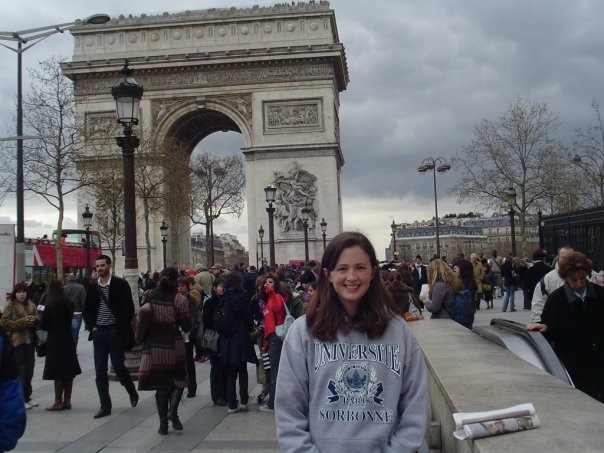 Me in Paris in 2008. I had to buy that sweatshirt because I underestimated just how cold it would be! Paris may be romantic, but the first time I went, I went with my parents. We had a great time, but maybe this time I’ll get to experience its romantic side? Mario and I didn’t exactly go to Rome with a “fine-dining” budget, but we did eat well, thanks to his cousin’s recommendations. 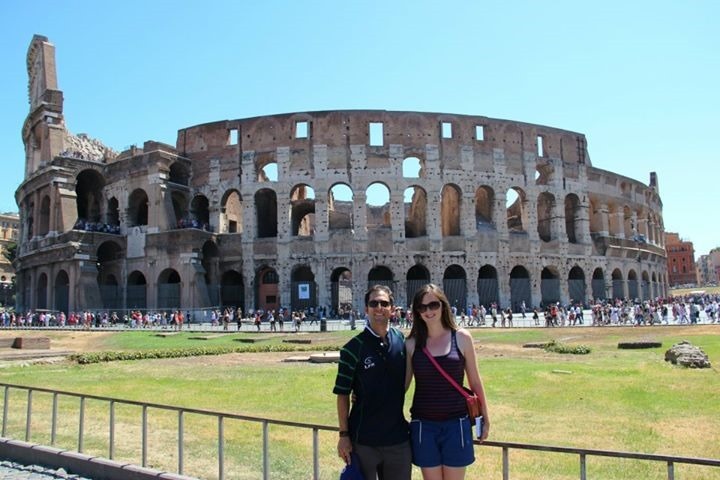 She had lived for many years in Rome, so we got all the cute, hole-in-the-wall-type places, and they were excellent. I’m sure Mario still remembers his saltimbocca alla romana and our free limoncello shots! I didn’t do much art exploring, but I definitely did some architecture exploring in Cataluña’s most-touristy city, Barcelona. I’ll admit to not having too many fond memories, though; after this picture was taken, my passport was stolen! 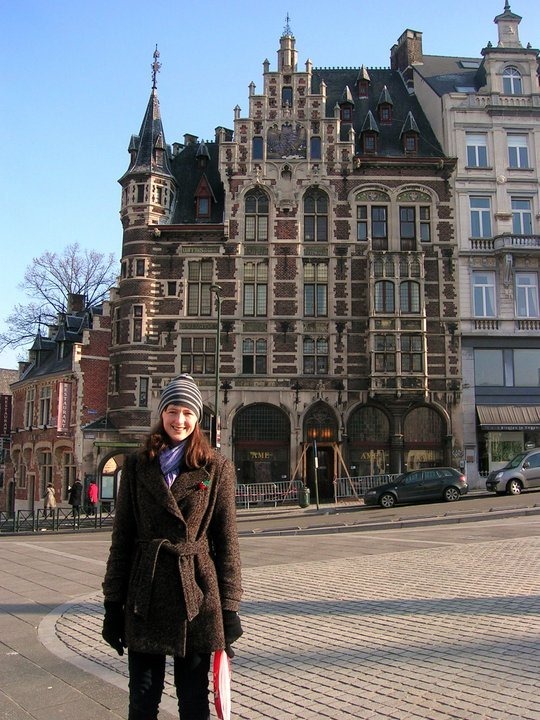 Brussels is brutally cold in January! Mario and I bought super-cheap tickets from everyone’s favorite/least-favorite airline, RyanAir. Our flight went off without a hitch though, and I loved the European vibe, but even more so the chocolate and waffles! Bruges was magical, and it was a great daytrip from Brussels. 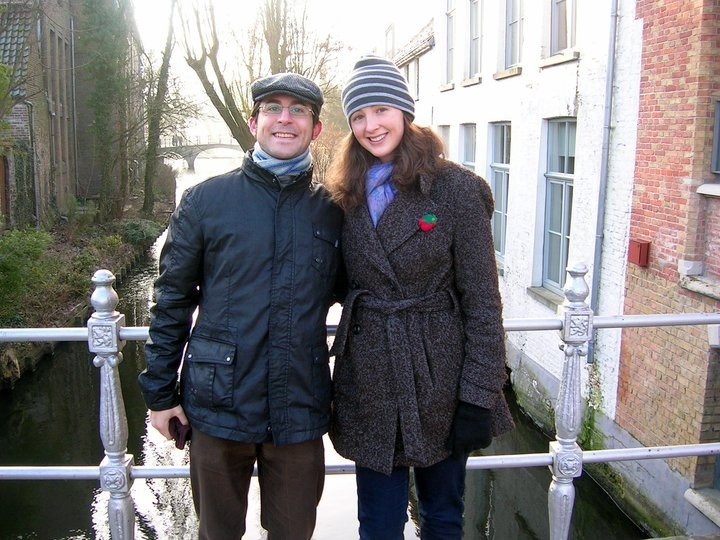 We loved walking around the canals, seeing the Begijnhof. I suppose the only place I haven’t been on the list is Edinburgh! Don’t worry, though; I’m sure I’ll get there soon enough on our next city break! Where are you favorite places to go to get away? You have to get to Edinburgh! It is the most magical city. I know that sounds totally lame and cliche, but I really felt like I had stepped back in time. I went there not knowing what to expect and left completely enamored. Plus I got my eyebrows threaded there, for the first time in six months, which was a plus. It’s my favorite city (along with Granada, of course). You should go to Prague. It’s probably cold rigth now but I’m pretty sure it’s not too cold, I went in April and had lovely weather. Also Berlin, I’ve been told that, although cold, it’s a wonderful city to visit. On that list, I haven’t been to Edinburgh, Paris, and Rome. Gotta bucket list those three! #1 See the Sights: Definitely London. I’ve been there twice, and there’s still so much I have yet to see and want to see when I go back. #2 Romance Getaway: Everyone says Paris but I haven’t been so I’m choosing Sevilla since I had a really nice romantic getaway when my bf and I went there. #4 Food and Fine Dining: Hands down, Sardinia and Bergamo, Italy. The Italians never do it wrong. I’m a foodie, and I had the most amazing and unforgettable food experience when I was there. Sardinia with their fresh seafood – from fish to sea urchin, their goat cheese, Prosciutto, etc; Bergamo with their amazing meatballs and pasta, and everything else. Aw! I wanna go back. Fave places to get away in France: TOULOUSE! I studied abroad there junior year and fell in love. They call it “la ville rose” (the pink city) because most of the buildings are made out of red brick and when the sun goes down, it makes the city look pink. Paris is great and all, but there are so much more to France than Paris. And I know for a fact (or maybe they got rid of the flight but I think it’s still there) Easyjet or RyanAir has a direct Madrid-Toulouse flight. You should make a point to visit while you’re still visiting in Madrid, it is NOTHING like Paris. Also Edinburgh is really cool, I visited a friend who was studying abroad at St. Andrews. I would love, love, love to go back to Scotland. Very interesting blog! Did you do the statistics yourself? Very nice! 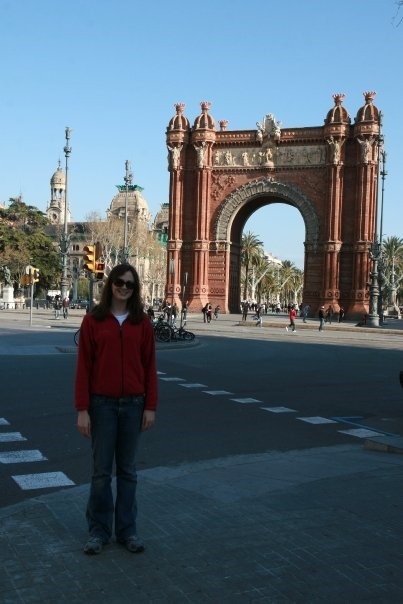 I also talk about Spain (Barcelona) and Europe in my blog! No, the stats were provided by a company I was working with! But I loved the infographic! As a Brit I should have visited all these places considering how close they are and how cheap a flight is these days, but I’ve actually only visited three of the seven: London, Edinburgh and Barcelona! The shame. I think I’d sooner go to Brussels and Bruges over Paris though. Have you considered going to Edinburgh for Hogmanay? I went last year and it was magical! No, actually I’ve not even heard of Hogmanay! I looked it up, and it looks great! However, I am a huge homebody and go home for the holidays every year … so sad to say, I will miss it. I definitely think Bruges is more of my style than Paris, but Brussels is a Parisian-type city with not as much to see. However, it IS worth seeing if you can get there.